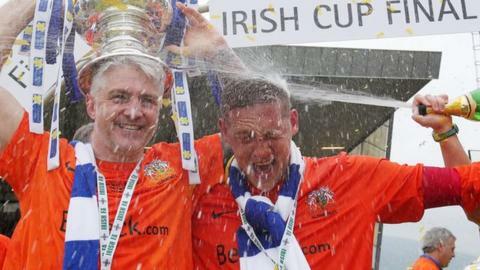 Glenavon's defence of the Irish Cup will start with a trip to Championship Two club Moyola Park on 10 January. Gary Hamilton's men were handed the Mill Meadow assignment in Wednesday's draw for the fifth round which sees the Premiership clubs enter the fray. Ballymena, beaten in last May's final will be at home to Amateur League outfit Crumlin Star and Linfield are away to Tobermore United. Cliftonville are at home to Ards Rangers of the Amateur League. There are two all-Premiership ties with Dungannon Swifts hosting Ballinamallard United and Coleraine facing Warrenpoint. Crusaders have been drawn against Championship Two Newington with whom they share their Seaview ground. Glenavon boss Hamilton was happy enough with his club's draw. "If you don not get a home draw, the next best thing is an away game against a team from a lower division." he said. "But we still have to go there with the right approach and show hunger and desire. "Sometimes you can slip into a bad mindset in games like these and start thinking it is easier than it actually is. "But if we have the attitude we should go through."